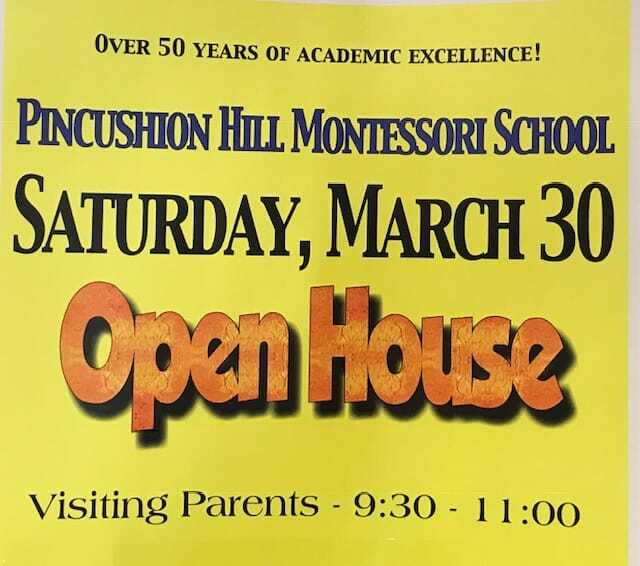 Located in the Metrowest region outside of Boston near I-90, Route 9, and Route 135, Pincushion Hill Montessori School has been serving families from Ashland, Dover, Framingham, Holliston, Hopkinton, Millis, Natick, Northboro, Sherborn, Shrewsbury, Southboro, Sudbury, Wayland, Wellesley, Westboro, Weston, and the surrounding communities since 1962. 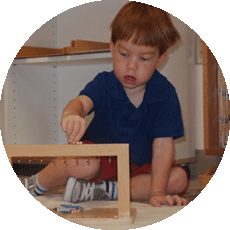 Offering an exemplary education for preschool, kindergarten, and elementary-age children based on the Montessori Method, the Pincushion Hill Montessori School is deeply committed to providing a challenging and nurturing environment. Children are encouraged to learn at their own pace, supported by their peers and teachers. Our children love school! Children learn from one another—this can be seen in family and play situations when they are free to observe and interact in a variety of activities. In their preschool years, children have “an absorbent mind”—they effortlessly absorb everything in their environment. When children reach the traditional age for kindergarten, their reading, writing, and mathematical understanding can begin to blossom if the right seeds are planted in the previous years. Elementary-age children begin realizing that the world is a fascinating place. This is a time of insatiable curiosity and excitement for learning, when children strive for intellectual independence. Based on these observations on childhood development and education, Dr. Maria Montessori developed Montessori Method of education over a century ago. Her child-centered educational approach values the development of the whole child—physical, social, emotional and cognitive—and engages the child’s heart, mind, hand, and spirit in a thoughtful and purposeful way. This method is designed to empower children to direct their own education and develop a sense of independence and competency. As children progress and master the topics at their own pace, they also develop a joy of learning and critical thinking that carries through into adulthood. 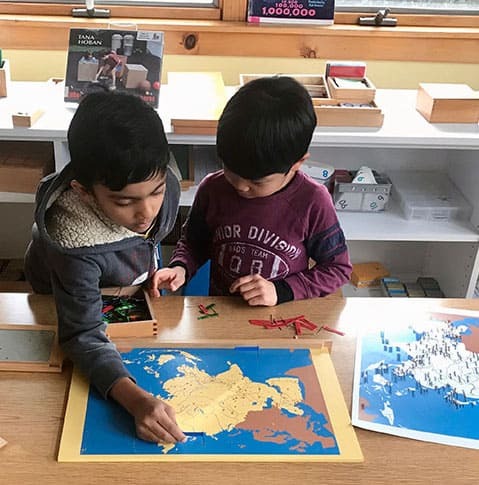 And while a child’s intellect is thoroughly stimulated and challenged in the Montessori classroom, equal importance is placed on developing social competence, character, and a sense of community. Montessori classes are different from traditional structured classrooms, so we encourage you to visit and explore our school and gardens. We offer regularly-scheduled open houses and tours, or contact us or call (508) 881-2123 to arrange your visit. 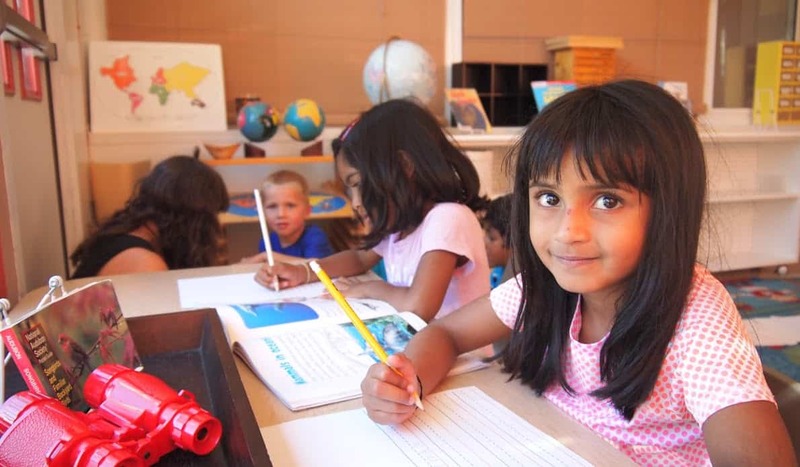 The Pincushion Hill Montessori environment provides a gentle way to learn that leads to a world-class education without the stress found in most schools. Our students enjoy school because we focus on the potential of the individual child while encouraging independence. Pincushion Hill offers an ideal setting for your child if you are looking to inspire him or her to develop a lifelong love of learning. Children learn high levels of cognitive and social skills not only through mental development, but also by observing others as models. Activities include Practical Life, Sensorial, Language, Mathematics, Sciences (including a gardening program), Makerspace (STEM), Geography, History, Art, Music, Spanish, Meditation, and many life skills. The Elementary curriculum carefully guides the child through researching interesting concepts in many fields of study. Areas of exploration and study include Practical Life, Sensorial, Mathematics, Language Development, Sciences, Botany (including a gardening program), Zoology, Geography, History, Makerspace (STEM), Art, Music, Spanish, Meditation, Physical Education (a health program), and many life skills. We offer a variety of after school Enrichment Classes to all children on a sign-up basis. Classes are offered at the beginning of each semester and range from 30-45 minutes in duration, and include piano, music enrichment, art enrichment, and MakerSpace. Our music program allows children to express themselves individually while also learning how to participate with their classmates. They learn the basic elements of music such as rhythm, tempo, pitch, dynamics, and then put these elements to use in listening exercises, instrument playing and singing, as well as reading and writing music. Students have access to Chromebooks to help build academic preparedness. Coding is introduced in the elementary classroom to teach computational thinking, programming concepts, and collaboration. Our new MakerSpace provides opportunities to work as individuals and teams on design, engineering, robotics, and problem-solving. Hands-on experience is offered on-site in the vast gardens throughout the property. This outdoor laboratory provides a year-round understanding of botany, and appreciation of the beauty and bounty of flowers, fruits, vegetables. 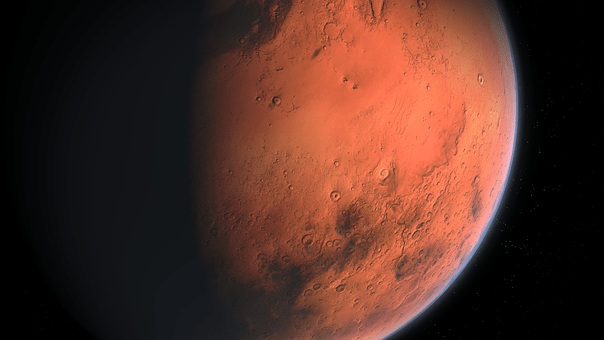 Children will learn about habitats, environmental health, planting cycles, and the connection between humans and the earth. Our art program encourages students to be creative, think outside the box, and express themselves artistically using a variety of materials. Students also learn about art from different world cultures and art movements. Extra time to get hands messy and make art is offered in our After School Enrichment Classes. Our children begin the study of the Spanish language in their first year and progress further with each year. The objective is to introduce our children to this increasingly prevalent language while enriching their understanding of language in general, and providing tools that will help them to succeed in a wide range of academic endeavors. Our students participate in at least 30 minutes of recess daily. In keeping with our philosophy of educating the whole child, students are also introduced to meditation, yoga and the the MindUP curriculum for development of strong social-emotional skills. Elementary students also take part in a formal physical education program and a wellness curriculum. 2019 Summer Discovery Program Enrollment Open!